‘Do hope you and Nina are well and enjoying our exceptional weather. ‘Been having some swirling pictures and thoughts – sorry to dump them on you but do feel called to look for others to join me in prayer on this particular line. 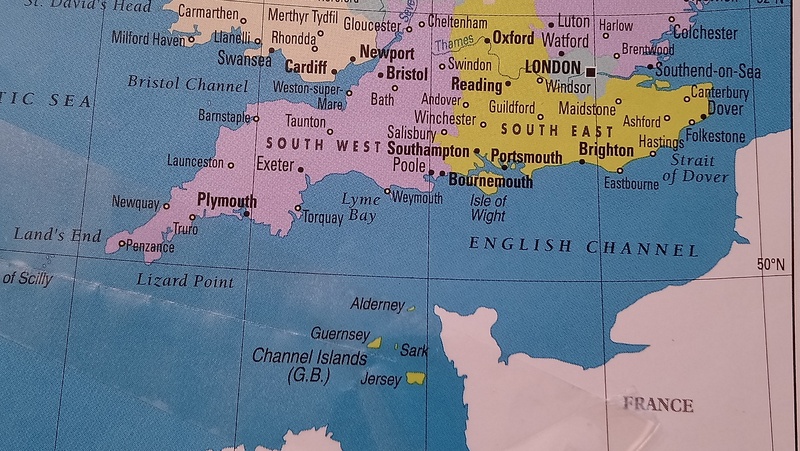 ‘A few weeks ago (early May 2018) God showed me a picture of the English Channel parted from the centre (Isle of Wight) to Dover in the East and to The Lizard in the West. I asked if this was for an “exodus” and if so, in which direction? The Lord said to look again. I saw revealed on the sea bed what looked like hawsers stretching across the Channel. I decided they must be mooring lines and that we needed to cast them off, as if we were a ship leaving port. ‘The Lord said, “Look again”. I saw that what I’d thought were mooring lines were alive and writhing! The Lord said these are the tentacles of the serpent that seeks to hold Great Britain in the web-like structure of nations that he is creating. The members of the EU have been led into an unholy alliance which seeks to undermine their individuality, and which advocates a federal form of ungodly humanism. Until Brexit, no member state has ever sought to leave the EU – Satan is enraged. ‘What can we do? The Lord said the tentacles must be cut. ‘How? By the word of God that is the sword of the Spirit. ‘Over recent months the Lord has been showing me some insights into the spiritual significance of Winchester as the ancient capital of Britain, and the seat of the only English king to have the sobriquet “Great” (Alfred the Great). Winchester is built on strong biblical foundations and there is a reservoir of spiritual power and authority into which we can tap. ‘The Lord said to pray the word of God over the waters of the River Itchen which flows out from the city of Winchester. The river flows into the Solent and the Isle of Wight acts as a separator that divides the waters to the East and to the West. By the power of God, the water will be a scythe that cuts the tentacles of the serpent. “So, I turned to the Lord God and pleaded with him in prayer and petition, in fasting, and in sackcloth and ashes” (Daniel 9:3). It is clear from Daniel’s prayer that even though we think we know the course we are on, we still need to pray expectations into reality. We don’t know why it should be so, but that it is so is clear from Scripture, history and our experiences. God chooses to involve us in His purposes. ‘The battle is raging in the heavenly realms. As in Daniel 10, princes are fighting to retain their territories and they seek to thwart God’s plans. However, the angels of God are advancing and recovering lands: victory is assured. ‘We have so much to be thankful for, so much has been set in train by God’s design: now we most earnestly pray for God’s mercy and forgiveness, and for the full realisation of the restitution of Great Britain as an independent nation under God. ‘Afternote: I started rationalising my thoughts and applying logic, until I read Oswald Chambers’ devotion yesterday (26 May) “The danger with us is that we want to water down the things that Jesus says and make them mean something in accordance with common sense; if it were only common sense, it is not worth while for Him to say it. The things Jesus says about prayer are supernatural revelations”. For the Itchen’s location, zoom over Winchester on Map of British Rivers & Lakes. 2005: Vision for Great Britain, linked to the recent ‘Wilberforce Whirlwind’ vision, has similar references to the EU having unseen roots into Britain. For more on the importance of Winchester see GPS#12: King Alfred, a ‘Spiritual Magna Carta’ for Britain – and the World! See GPS #17 for ‘God-incidental’ events on the IoW. This entry was posted in Dreams & Visions, Europe-EU, Prayer, UK and tagged Brexit, Daniel, Gods_GPS, Prophecy-today by Richard Barker. Bookmark the permalink. Interesting that serpents are mentioned as I’ve seen a vision over the past couple of days of a huge serpent with a cross stuck through its tail. I saw the serpent hissing with its mouth open and seemed also to be crying out. The cross had him pinned and unable to move. He could only hiss. Terrific Tony, what a blessed, victorious vision. The demonic is terrified of the Blood and Cross of Christ and in occasional deliverance ministry I’ve relished reminding the unclean spirits of that fact. I looked up Neil’s book and noticed his biography, he has had a very interesting life! I noticed a book on Wessex in my bookcase today and looked up Winchester. I read that King Alfred defeated the Danes at the Battle of Edington in May 878 and the Danish King Guthrum converted to Christianity afterwards. I hope a good omen to Neil’s references to May 2018. It will be interesting to see what the announcement of the Trade War between the US and the EU brings forth. This report has been in various media at the weekend and perhaps ties in with Neil and Tony’s serpent. It sure does Phil and is what I too thought when scanning the day’s newstand. You may like to run a search on this blog on his name. PS. It was mid-week when I saw it. Going off topic but interesting to see how God has intervened to provide the DUP with the balance of power over Brexit and now it seems the DUP’s power may be enhanced by their stand on abortion. I can’t say I know anything about their policies but just interested in how this is playing out. Thanks for the information on G. S. I will have a read. Richard, this is what Ann and I prayed and proclaimed this morning concerning this vision “In that day the Lord with His severe sword, great and strong will punish Leviathan the fleeing serpent, Leviathan that twisted serpent; And He will slay the reptile that is in the sea” (of peoples, and the Channel). Isaiah 27 v 1. Blessings, dave. AMEN, and again Amen. This seems to relate to what Veronika West posted, as reported by UKPW at http://ukpropheticwords.blogspot.com/?view=classic – the refc to major cities may connect into Wendy Alec’s 2005 Vision (see just after her refc to the Lionheart’s roar). Surprised to read this and insightful comments. Neil’s prayer strategy is not dissimilar to how I’ve felt led to pray in my own locality, declaring Revelation 22:1-2 and Leviathan’s downfall from the source head of a local tributary into the River Thames. Back in October 2016 the HS said he had a strategy to “cleanse the spiritual rivers of London”. I saw Leviathan pulled up onto the Thames river bank, along with his “fishes”, his body was exposed, white and stinking and birds were devouring his flesh. At the time, I wasn’t sure why God had said “rivers” (plural) when I thought there was just one river, the Thames, but revelation has been unfolding and I believe God is revealing the way/ways “in” so we can recover what’s been defiled. Wondering if there’s a connection with your bigger jigsaw on “castles”, Wessex and Alfred’s legacy? See also stock image of Thames River God (aka Leviathan), usually depicted as muscular strong man being or holding “the source” (false Godless religion) but Revelation 22 river flows from the throne of Yeshua. From the back he looks serpentine.